It’s 2017: Do you know what your credit score is? Good credit is important for many reasons beyond qualifying for the best loan rates. And the very first step in building it is knowing your starting point. But a NerdWallet survey finds that while more than a quarter of Americans (26%) check their credit scores monthly or more often, nearly 1 in 8 (12%) have never checked their scores. 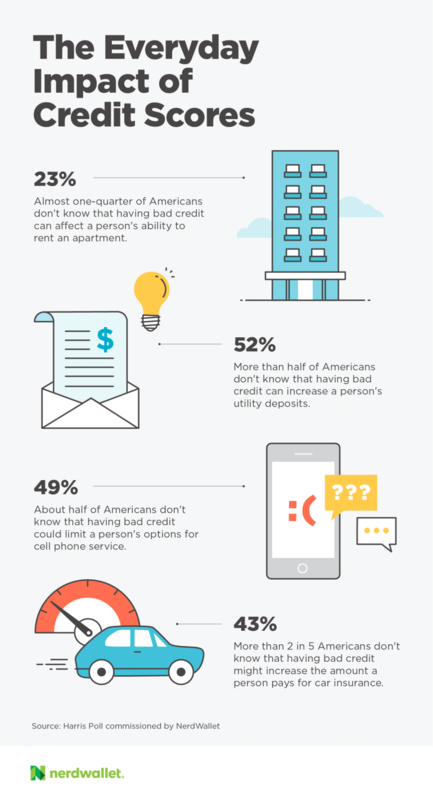 About half of Americans (49%) don’t know that having bad credit can limit a person’s options for cell phone service. There are ways to get a cell phone without a credit check, but consumers with poor credit have fewer options. Almost a quarter of Americans (23%) think a person has just one credit score. Most consumers have many scores, and they can vary based on the information used to calculate them. The score provider and score model your lender will consult depends on the reason you’re looking for credit: there are auto-specific and mortgage-specific scores, for instance. More than 2 in 5 Americans (41%) think carrying a small balance on a credit card month to month can help improve a person’s credit scores. This is a common misconception. To avoid interest charges, pay off credit cards each month. About 40 million Americans have a FICO credit score lower than 600 , and many might not understand the impact it can have on their everyday lives, even if they’re not applying for loans or saddled with high-interest debt. Having bad credit is expensive, and not just because of the high interest rates lenders charge. More than 2 in 5 Americans (43%) don’t know that having bad credit can negatively impact the price of car insurance, and more than half (52%) don’t know that it can negatively impact the cost of utility deposits. These expenses are often cheaper or nonexistent for those with excellent credit, even though they don’t involve borrowing money. Bad credit can even limit housing opportunities. Many landlords check applicants’ credit reports, but almost a quarter of Americans (23%) don’t know that having bad credit can negatively impact a person’s ability to rent an apartment. And almost half (49%) don’t know that bad credit can limit the ability to get a cell phone. Consumers with bad credit might be restricted to prepaid phones and miss out on carriers’ best plans. It might even be challenging to get certain jobs with poor credit. More than 1 in 5 Americans (21%) believe that a person with a credit score above 600 will qualify for any credit card he or she wants. Another 40% aren’t sure if a score above 600 qualifies a person for any credit card. In fact, 600 is a below average score and won’t give consumers access to most of the cards on the market. Consumers with excellent credit have almost eight times as many credit card options as consumers with bad credit do. Those with bad credit miss out on the cards with the best rewards and lowest interest rates, as well as the best purchase protections and travel benefits. Why do so many Americans have bad credit? Here’s one possibility: Increases in the cost of living have outpaced income growth for the past 13 years, according to NerdWallet’s annual household debt study. Many consumers might be maxing out credit cards to bridge the gap and then falling behind on payments or defaulting. Another theory is that Americans simply don’t understand how credit works. Our survey found many misconceptions about credit scores, including the number of scores people have and the factors that go into them. A credit score is a three-digit number, usually on a scale of 300 to 850, that estimates how likely someone is to repay borrowed money. If you make regular payments to a lender — on a credit card or auto loan, for example — you probably have credit scores. More than 1 in 10 Americans (11%) think everyone starts out with a perfect credit score. Actually, you must build your scores from scratch — but they don’t start from zero. Want to measure your progress? Your scores won’t necessarily be listed on your credit report, although almost two-thirds of Americans (64%) think they are. The free credit reports available once per year from AnnualCreditReport.com don’t include scores. However, you can get free scores from various sources, including NerdWallet. Five basic factors go into most credit scores: payment history, credit utilization, length of credit history, types of credit in use and new credit. Payment history: One of the best things you can do for your credit scores is to make payments on time, 100% of the time. You’re best off paying your entire credit card balance, but at least pay the minimum by the due date. Creditors won’t report payments that are only a few days late to credit bureaus, but pay 30 days or more late and you can tank your scores. Credit utilization: This refers to the proportion of your available credit you’re using at any given time. Between 1% and 30% is ideal, but people misunderstand these numbers. Possibly because using credit helps your scores more than not using it at all, more than 2 in 5 Americans (41%) think carrying a small balance from month to month can help improve a person’s scores, while one-fifth (20%) think it can hurt it. In fact, whether someone carries a small balance probably doesn’t affect his or her scores at all. “The idea that you have to carry debt to have good credit is a dangerous, expensive myth that needs to die,” says NerdWallet columnist Liz Weston, author of the book “Your Credit Score.” Carrying a balance will mean you pay interest, but it probably won’t have any impact on your credit — just your wallet. Length of credit history: This includes the total time you’ve had credit — starting from your first credit card or loan — and the average age of all your credit accounts. It’s a good idea to keep your oldest account open and avoid closing other older, unused accounts unless you have a good reason, like they charge annual fees or you need to shed a joint account. If you do choose to close other accounts, keep length of credit history in mind to limit the negative effect on your scores. Mix of credit accounts: Having a mix of account types doesn’t have a large impact on credit scores, but it might be helpful to have both revolving accounts, such as credit cards and lines of credit, and installment loans, such as mortgages, auto loans or student loans. You can build and maintain good credit with just one type of account. New credit: The final factor concerns the number of new accounts you’ve opened or applied to open. When you apply for a credit card or loan, a “hard” inquiry appears on your credit file. Checking your own scores results in a “soft” inquiry that won’t hurt your credit. But hard inquiries aren’t great for your scores, so you’ll want to limit the number of applications you submit. The exception is when you’re “rate shopping” for a mortgage or auto loan. In these cases, it’s smart to apply at several different lenders to get the best rate. The credit bureaus count multiple inquiries as a single inquiry as long as they’re made within a certain time frame, usually a few weeks. Improving your credit means working on the five factors above. However, you also might be able to improve your credit by catching mistakes on your credit reports. Most consumers have one at each of the main credit bureaus: Experian, TransUnion and Equifax. You can obtain each of these reports for free once per year. Once you receive your reports, read each one closely and dispute any errors. Incorrect information could hurt your credit, denying you access to low loan rates, superior credit products and other benefits of good credit. People trying to build credit commonly run into a catch-22: They need a loan or credit card to increase their scores, but they can’t get approved for a loan or credit card because their scores are low or nonexistent. For example, it’s hard to find good credit cards for bad credit. Credit-builder loans: These loans typically have low interest rates, regardless of your credit scores. But there’s a catch: You don’t receive the money from the loan until you pay it off. These loans exist solely for the purpose of building credit. The lender puts the money into a savings account, and you can claim it once you’ve paid the balance in full. The bank will report your payments to the credit bureaus, which should help your scores, provided you’ve made all the payments on time. Secured credit cards: With a secured card, you put down a security deposit that’s usually equal to the card’s credit limit, but sometimes is less. This reduces the issuer’s risk. Not everyone who applies for a secured card gets approved, but they’re still a good option for those with bad credit. Secured cards aren’t prepaid, so it’s critical that you pay off your charges each month. After “graduating” to an unsecured card or closing the account in good standing, you’ll get your deposit back. Secured personal loans: If you want to build credit but also need a loan, a secured personal loan might be the way to go. These allow you to borrow against a car, savings account or other assets, including such things as a recreational vehicle or furniture. The rate will likely be higher than it would be on a credit-builder loan, but you’ll have access to the loan money. This survey was conducted online within the U.S. by Harris Poll on behalf of NerdWallet from April 6-10, 2017, among 2,250 adults ages 18 and older. This online survey is not based on a probability sample, and therefore no estimate of theoretical sampling error can be calculated. For complete survey methodology, including weighting variables, please contact cc-studies@nerdwallet.com. According to Ethan Dornhelm, principal scientist at FICO, there are about 40 million U.S. consumers with credit scores below 600. There are an additional 53 million Americans who can’t be scored because they have too little information on their credit file or no credit file at all. According to the NerdWallet database of more than 1,200 cards, there are 7.7 times as many cards available to those with excellent credit compared to those with poor/bad credit.